Before you can start drawing a fashion face, you first have to draw a head with a face grid. When you’re ready for your face, you can adjust the guide lines on the face grid to reflect various views of the face as it slowly turns. 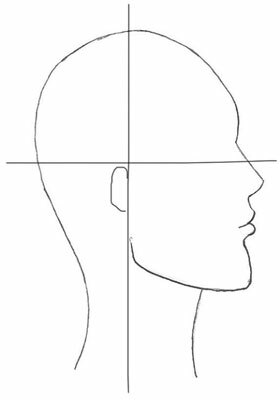 When you draw a profile, for example, the center front line moves all the way to the side. Other than keeping the fashion figure head small, there’s not much difference between drawing a forward-facing head on a figure drawing and drawing one on a fashion model. Of course, you can’t always draw faces that look straight ahead in the front view. Nor would you want to, when you have so many fabulous angles to choose from! A face in a three-quarter view is more subtle than the front view. When a face is seen from the three-quarter view, it lends some mystery to the fashion figure. Start with an oval like the one shown. Use your face grid for feature placement. The vertical line marks the center front of the face. The horizontal line that appears halfway down the oval marks the eye level. To turn the face, move your center front line slightly to the right. Moving this line moves the figure’s facial features — eyes, nose, and mouth — slightly to the right as well. Curving the guide lines slightly adds dimension. Map out the placement of the eyes, nose, and mouth. 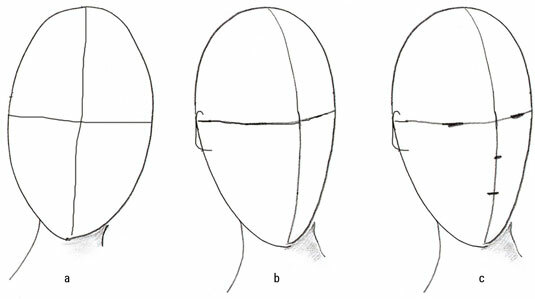 Notice that the side of the head facing you is more pronounced; the far side of the face slides to the back with less obvious features so that the fashion figure’s left eye is barely visible. As the head turns, you also start to see the back of the head as well as where the ear will eventually be. You’re your own best model when studying facial features. Try this exercise: Look at yourself in the mirror and slowly turn your head to your right side. Notice how your features change and fall into various three-quarter positions. One side of your face becomes more noticeable as the other recedes. Pay attention to models in photographs and how their heads turn to further explore various views of the face. Profiles are used frequently in fashion drawing because they convey an elegant, haughty look. Start by drawing an oval and a face grid. Sketch in the forehead, eye, nose, and lips from the side view. Draw the top and back of the head, curving in as you approach the neck. Place the eye slightly above the center horizontal line and the nose a little below it. The nose in a profile view is just a slanted angle shape. Draw the lips in profile outside the oval, about halfway between the middle horizontal line and the bottom. The top lip curves up toward the nose, and the lower lip curves down toward the chin. Keep the lower lip slightly fuller than the upper lip. The lips protrude slightly from the face. Form the chin, making sure you dimple in the skin just under the lip. Keep the chin more rounded for women and children, and present a square look for the guys. Add the ear by sketching in a C shape around where the guide lines cross. Lightly sketch in the jaw by continuing the line from the chin to the ear. The top of the ear lines up near the eyes. A woman’s jawline generally angles up toward the ear. A man’s jawline is flatter, which gives him a rugged look.